Context: Candida spp. is an emerging cause of bloodstream infections worldwide. Delay in speciation of Candida isolates by conventional methods and resistance to antifungal drugs in various Candida species are responsible for the increase in morbidity and mortality due to candidemia. Hence, the rapid identification of Candida isolates is very important for the proper management of patients with candidemia. Aims: The aim was to re-evaluate the identification of various Candida spp. by polymerase chain reaction (PCR)-restriction fragment length polymorphism (RFLP) and to evaluate the accuracy, speed, and cost of phenotypic methodology versus PCR-RFLP. Settings and Design: Hospital-based cross-sectional study. Materials and Methods: Ninety consecutive clinical isolates of seven Candida species, isolated from blood of neonates and identified by routine phenotypic methods, were re-evaluated using universal primers internal transcribed spacer 1 (ITS1) and ITS4 for PCR amplification and Msp I restriction enzyme for RFLP. Statistical Analysis Used: Kappa test for agreement. Results: The results of PCR-RFLP were 100% in agreement with those obtained using conventional phenotypic methods. Identification could be achieved within 3 work days by both the methods. Our routine methods proved to be cost effective than PCR-RFLP. Conclusions: We can continue with our routine phenotypic methods and PCR-RFLP can be used for periodic quality control or when conventional methods fail to identify a species. Candidemia is a significant cause of mortality and morbidity in neonates. Although Candida albicans has historically been the most frequently isolated species, recently non albicans Candida (NAC) have emerged as important opportunistic pathogens. In this study, polymerase chain reaction (PCR)-restriction fragment length polymorphism (RFLP) using restriction enzyme, MspI was used to re-identify the clinical isolates of various Candida species previously identified by conventional phenotypic methods. Furthermore, the accuracy, speed, and cost of phenotypic methods were compared with PCR-RFLP. The study was conducted over 1 year from October 1, 2013, to September 30, 2014. It included ninety consecutive clinical isolates of seven Candida spp. that had been recovered from blood of neonates admitted in Neonatal Intensive Care Unit (NICU) of our tertiary care hospital over 2 years period starting from June 2012. These test strains identified by conventional phenotypic methods such as colony color on Hi-Crome Candida agar, cornmeal agar (CMA) morphology, and carbohydrate assimilation tests, comprised 48 Candida krusei (53.33%), 12 Candida parapsilosis (13.33%), 11 C. albicans (12.22%), 8 Candida lusitaniae (8.88%), 5 Candida tropicalis (5.55%), 4 Candida glabrata (4.44%) and 2 Candida guilliermondii (2.22%). Antifungal susceptibility for these isolates was done by Vitek 2 compact (bioMe'rieux, Inc., France). All isolates of C. albicans, C. lusitaniae, C. parapsilosis, C. tropicalis and C. guilliermondii were sensitive to fluconazole, voriconazole, amphotericin B, caspofungin, and flucytosine. All isolates of C. krusei were resistant to fluconazole and moderately sensitive to flucytosine. Twenty-five percent of C. glabrata were resistant to fluconazole and moderately sensitive to voriconazole. Standard strains of C. albicans, C. krusei, C. parapsilosis, C. tropicalis, C. guilliermondii, C. glabrata, and C. lusitaniae were obtained from National Culture Collection for Pathogenic Fungi, Mycology Division, Postgraduate Institute of Medical Education and Research, Chandigarh, India. Study and control strains preserved in 10% glycerol at –70°C were subcultured on Sabouraud's dextrose agar and incubated at 37°C for 24 h. DNA extraction of the cultured isolates was performed by phenol-chloroform method. Digestion of amplified products was performed using restriction enzyme MspI. The reaction mixture was spinned down for a few seconds and incubated at 37°C for 90 min.,, The reaction was stopped by incubating at 80°C in a dry bath for 20 min. The restriction products were loaded alongside the PCR products onto 2.5% agarose gel, run in TBE buffer for 1 h at 60 V and viewed in the Gel Documentation system. Statistical analysis was performed by Kappa test for agreement. Of the ninety clinical isolates and seven standard strains of Candida spp., universal primers ITS1 and ITS4 were able to successfully amplify the ITS1-5.8S rDNA-ITS2 region of their rDNA yielding PCR products of approximately 383–871 bp related to seven Candida spp. Isolates of C. glabrata, C. guilliermondii, and C. lusitaniae could be discriminated on the basis of PCR product size alone which is 871, 608, and 383 bp respectively due to well discernible differences. Digestion of ITS1-5.8SrDNA-ITS2 region of PCR amplicons of seven Candida species by MspI yielded 2 bands for C. albicans (297, 238 bp), C. krusei (261, 249 bp), C. tropicalis (340, 184 bp), C. glabrata (557, 314 bp) and C. lusitaniae (266, 117 bp) and 3 bands for C. guilliermondii (371, 155, 82 bp) as expected. However, there was no recognition site for this enzyme within the ITS region of C. parapsilosis and its PCR and digestion products were the same (520 bp). RFLP pattern produced for each Candida spp. [Figure 1] and [Figure 2] was completely specific as none of the species examined was mistaken for another. 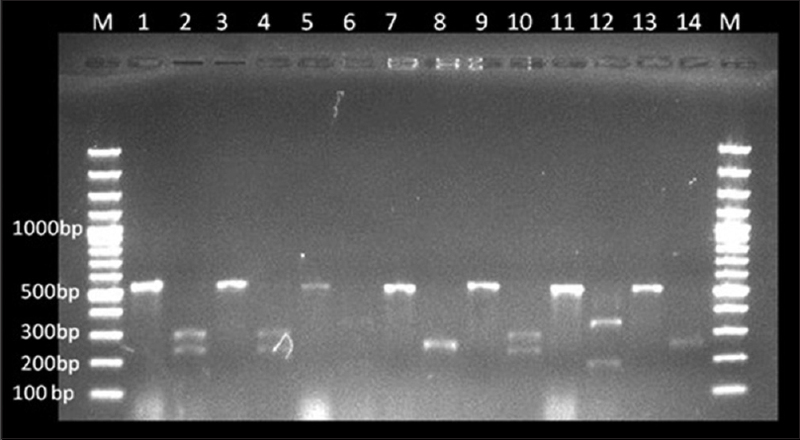 It was not possible to delineate two RFLP bands of C. krusei on agarose gel even when we used 3% gel and electrophoresed it for a longer time (1.5 h) as its restriction products (261 and 249 bp) have a difference of 12 bp only and appeared as a single band of around 250 bp. In this study, the results of conventional phenotypic identification methods were 100% accurate when compared to the gold standard, PCR-RFLP which was also statistically significant [Table 1]. Overall there was no difference in the time taken by the two methods [Table 2]. C. albicans, C. tropicalis, C. krusei and C. glabrata could be identified in 1–2 work days by color on Hi-Crome but for other NAC species, CMA and assimilation had to be put up extending the time to 3 work days for identification by conventional phenotypic methods. C. glabrata, C. guilliermondii, and C. lusitaniae could be identified earlier (2 work days) by PCR alone, but for C. albicans, C. tropicalis, C. parapsilosis, and C. krusei, RFLP had to be done extending the time to 3 work days. Total cost per isolate by PCR-RFLP was 1.69 USD and by conventional tests was 1.32 USD. Thus, conventional tests proved to be cost effective than PCR-RFLP. Moreover, carbohydrate assimilation test using commercial discs accounted for major part of the expenditure (1.21 USD) in conventional methodology. Candida species account for 8%–10% of all nosocomial bloodstream infections  and for 9%–13% of all blood isolates in NICUs. Given the dramatic expansion of NAC yeast infections and their distinct antifungal susceptibility pattern, accurate identification becomes essential for clinical management. 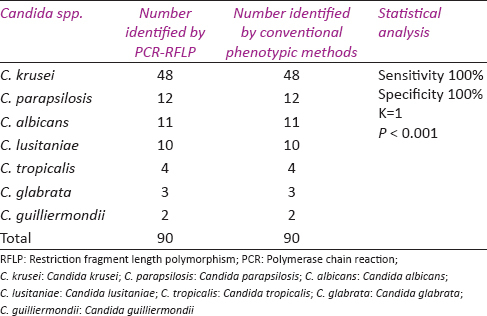 This study was undertaken to compare the accuracy, ease, and speed of our conventional methods for identification of Candida species with PCR-RFLP as the gold standard. Characteristic profiles obtained following restriction digestion of ITS1-5.8SrDNA-ITS2 region by MspI expanded the identification to seven Candida species including C. albicans, C. krusei, C. glabrata, C. parapsilosis, C. tropicalis, C. lusitaniae, and C. guilliermondii, which account for up to 95% of Candida infections. MspI can also be used to identify Coprosma rugosa (121 bp, 277 bp), Candida bracarensis (253 bp, 552 bp), and Candida nivariensis (205, 236, 319 bp) increasing the identification panel of our method to eleven species. In some studies, two and three enzymes , have been used to identify eight Candida spp. but the use of more enzymes increases the cost of the method and also makes it more lengthy and cumbersome. The majority of isolates (54.44%) in our study were resistant to fluconazole out of which 97.95% were C. krusei rest being C. glabrata. All C. albicans isolates were susceptible to fluconazole. Prior exposure to fluconazole is the single most important factor leading to fungemia caused by less susceptible NAC species, such as C. krusei and C. glabrata as seen in our hospital where fluconazole is the mainstay of anti-Candida therapy and prophylaxis. Time taken by PCR-RFLP was same as that of our routine conventional methods [Table 2]. PCR-RFLP alone could be done within 6 h which is in agreement with other studies., To decrease the time to identification of Candida spp. in candidemia by molecular methods, other modifications appear to be promising like faster extraction of DNA from isolates by commercial kits; direct DNA extraction from positive blood cultures; direct PCR from blood obviating the need for DNA extraction; multiplex PCR  and real-time PCR of blood giving results in 1 work day. However, all these methods will add to the cost. We found the conventional methods to be cost-effective which can be made still cheaper by in-house preparation of sugar discs used for carbohydrate assimilation test. For Candida species such as C. albicans, C. tropicalis, C. krusei, and C. glabrata where Hi-Chrome Candida agar gives the definite identification there is no need to put the carbohydrate assimilation test, further reducing the cost per isolate for conventional methods. Molecular procedures used in our study although relatively simple to perform and more accurate, require standard molecular biology equipment, three separate rooms for DNA extraction, master mix preparation and PCR amplification/RFLP analysis, and highly trained staff. Contrary to this, conventional phenotypic methods are very easy to perform and interpret except CMA morphology which needs an expert in mycology to interpret. Moreover, conventional procedures once put need to be interpreted on the due date without full-time involvement of the staff as is the case in PCR-RFLP. To conclude, we found our conventional phenotypic methods to be accurate enough to continue with them in our routine mycological practice. Moreover, the ease of putting them up, nonrequirement of separate working areas and less expenditure makes them more attractive in our set up where staff, space, and cost are the main constraints. However, PCR-RFLP with the advantages of high discriminatory power, potential for wide range of species identification and simple interpretation can be used for periodic quality control of our conventional methods and when conventional methods fail to identify a species. The authors would like to thank Sher-I-Kashmir Institute of Medical Sciences, Soura, Srinagar for funding the project and also thank Mycology Division, Postgraduate Institute of Medical Education and Research, Chandigarh for providing control strains for the project. Sher-I-Kashmir Institute of Medical Sciences, Soura, Srinagar funded the project. Srinivas Rao MS, Surendernath M, Sandeepthi M. Prevalence of neonatal candidemia in a tertiary care institution in Hyderabad, South India. Int J Res Med Sci 2014;2:1016-9. Juyal D, Sharma M, Pal S, Rathaur VK, Sharma N. Emergence of non-albicans Candida species in neonatal candidemia. N Am J Med Sci 2013;5:541-5. Simona ES, Diana P, Robertina I, Ionela A, Ileana S, Tatania VD. Molecular identification of some yeast strains involved in oral candidosis. Rom Soc Biol Sci 2009;14:4180-6. Williams DW, Wilson MJ, Lewis MA, Potts AJ. Identification of Candida species by PCR and restriction fragment length polymorphism analysis of intergenic spacer regions of ribosomal DNA. J Clin Microbiol 1995;33:2476-9. Vijayakumar R, Giri S, Kindo AJ. Molecular species identification of Candida from blood samples of intensive care unit patients by polymerase chain reaction-restricted fragment length polymorphism. J Lab Physicians 2012;4:1-4. Shokohi T, Hashemi Soteh MB, Saltanat Pouri Z, Hedayati MT, Mayahi S. Identification of Candida species using PCR-RFLP in cancer patients in Iran. Indian J Med Microbiol 2010;28:147-51. Allam AA, Salem IM. Evaluation of rapid molecular identification of clinically important Candida spp. isolated from immuno-compromised patients using RF-PCR. J Am Sci 2012;8:463-8. Mousavi SA, Khalesi E, Bonjar GH, Aghighi S, Sharifi F, Aram F. Rapid molecular diagnosis for Candida species using PCR-RFLP. Biotechnology 2007;6:583-7. Mirhendi SH, Kordbacheh P, Pezeshki M, Khorramizadeh MR. Simple and rapid identification of most medically important Candida species by a PCR restriction enzyme method. Acta Med Iran 2003;41:79-83. Pfaller MA, Pappas PG, Wingard JR. Invasive fungal pathogens: Current epidemiological trends. Clin Inf Dis 2006;43:3-14. Kavitha H, Anuradha K, Venkatesha D. Comparison of susceptibility of various Candida species isolated from neonatal septicaemia to voriconazole and fluconazole. IOSR J Pharm Biol Sci 2014;9:78-81. Cornet M, Sendid B, Fradin C, Gaillardin C, Poulain D, Nguyen HV. Molecular identification of closely related Candida species using two ribosomal intergenic spacer fingerprinting methods. J Mol Diagn 2011;13:12-22. Ghahri M, Mirhendi H, Zomorodian K, Kondori N. Identification and antifungal susceptibility patterns of Candida strains isolated from blood specimens in Iran. Arch Clin Infect Dis 2013;8:1-7. Mirhendi SH, Makimura K. PCR-detection of Candida albicans in blood using a new primer pair to diagnosis of systemic candidiasis. Iran J Publ Health 2003;32:1-5. Fahami S, Kordbacheh P, Moazeni M, Mahmoodi M, Mirhendi H. Species identification and strain typing of Candida isolates by PCR-RFLP and RAPD-PCR analysis for determining the probable sources of nosocomial infections. IRMCJ 2010;12:539-47. Giri S, Kindo AJ. A review of Candida species causing blood stream infection. Indian J Med Microbiol 2012;30:270-8. Ahmad S, Khan Z. Invasive candidiasis: A review of nonculture-based laboratory diagnostic methods. Indian J Med Microbiol 2012;30:264-9. Fujita SI, Senda Y, Nakaguchi S, Hashimoto T. Multiplex PCR using internal transcribed spacer 1 and 2 regions for rapid detection and identification of yeast strains. J Clin Microbiol 2001;39:3617-22. McMullan R, Metwally L, Coyle PV, Hedderwick S, McCloskey B, O'Neill HJ, et al. A prospective clinical trial of a real-time polymerase chain reaction assay for the diagnosis of candidemia in nonneutropenic, critically ill adults. Clin Infect Dis 2008;46:890-6.